I am currently on Maternity leave due to return back to work in October. 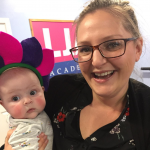 I am Project Manager working in Chessington my hours are 8am until 6pm and my husband is a Primary school teacher working in Peckham Sophie is our first child we live in Worcester Park. We are looking for child care 4 days a week (Wednesday my mum provides childcare) I would need to drop off by 7.30am and collect at 6.30pm . Sophie is turning 1 in October she is a very easy going happy baby.